Put the Web to Work: What Makes A Social Media Campaign G.R.E.A.T.? What Makes A Social Media Campaign G.R.E.A.T.? Why limit yourself to a good social media campaign? You could have a GREAT one! 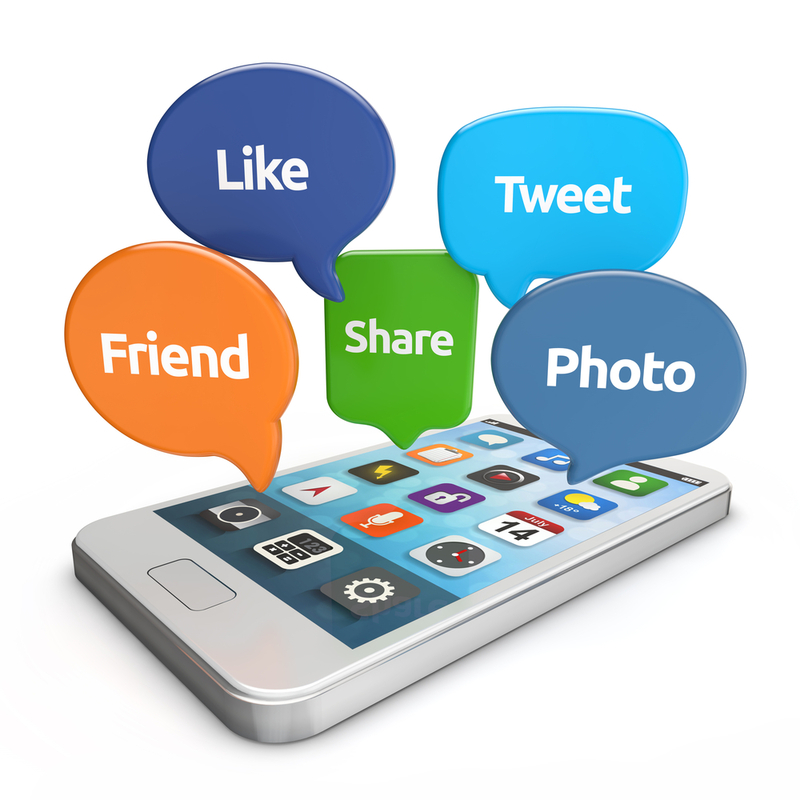 Social media is one of the most powerful marketing tools currently available. When leveraged correctly, it can dramatically increase your sales, web traffic, return on investment, and word-of-mouth referrals. However, in order to achieve these results, you have to have a great campaign. MSW Interactive Designs, LLC is here to explore some of the different components that make a social media campaign G.R.E.A.T. Good content is at the heart of any successful social media campaign. The content you produce must be interesting, relevant, and high-quality. Your content is what builds your credibility and encourages consumers to keep visiting your pages. It's what draws people in and establishes you as a leader in your field. When deciding what to write or post about, it's important to put yourself in your readers' shoes. What are your needs? What are your fears? What information would be most helpful to you? As you write, check and re-check you work to look for typos, spelling errors, and/or grammatical inconsistencies. The extra work you put in ahead of time will pay off significantly in the long run. The short paragraph makes it hard to convey the full depth of our message, but it's enough to get the point across. As you can tell, the eye is generally drawn to the paragraph that is broken into smaller sections. 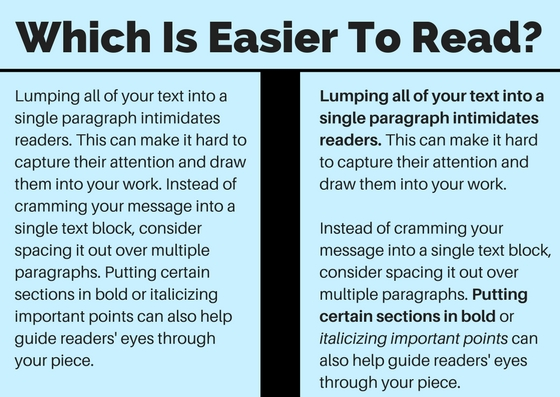 Using bold and italics to emphasize certain points also helps by creating visuals that are more engaging and enticing overall. As you focus on producing excellent content, keep in mind that your end goal is for people to engage with the content you publish. It's called "social" media for a reason - the most successful campaigns are the ones where people interact with the content that the company posts. Liking, commenting, and sharing are all examples of engagement. Generally, the more engagement a post gets in the beginning, the more it will continue to receive in the long run. Facebook posts provide a perfect example. While no one outside of Facebook completely understands how the news feed algorithm works, the general consensus is that Facebook displays to you the content that they think will be the most interesting to you. If a post has received a lot of interaction already, Facebook will be more likely to identify that post as one that will be interesting to you (and others). In order for a social media campaign to become and remain successful, you have to be accountable - both to your readers and to yourself. Being accountable to yourself means setting realistic, measurable goals for your campaign, monitoring your progress, and measuring your results. Goal setting is an important part of any business venture, and managing your social media campaign is no exception. Being accountable to your readers means posting high-quality content at regular, reliable intervals. Blowing up news feeds one week only to follow it with a week (or more) of radio silence can confuse your readers and hurt your credibility. It's important to establish regular posting schedule and stick with it as much as possible. One of the most significant advantages of social media is that it allows you to communicate and interact with your consumers in real time. Of course, this means that consumers have come to expect instant communication and may become frustrated with your brand if you do not respond to their messages, comments, or other inquiries quickly. In order to get the most out of your social media campaign, it is important that you respond to your customers quickly. We also recommend that you take advantage of real-time events as much as you can. Posting about limited-time offers, breaking news, in-office shenanigans, and other real-time events can be a great way to interact with your customers in a meaningful way. MSW Can Help Make Your Campaign G.R.E.A.T.! There you have it! 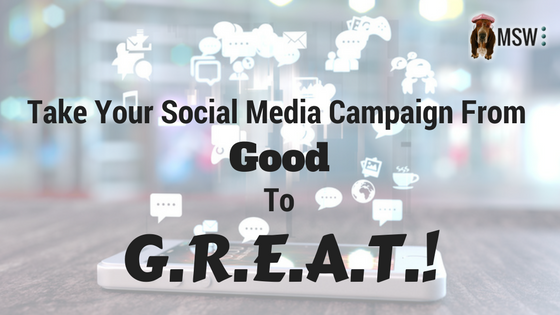 We have just revealed five components that make a good social media campaign G.R.E.A.T. - Good content, Readability, Engagement, Accessibility and Timeliness. 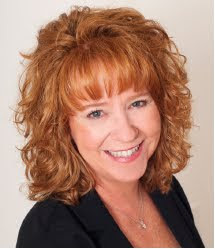 If you would like help taking your social media campaign to the next level, consider reaching out to our team of social media coordinators at the Lake of the Ozarks. Our experienced team has been managing social media for our client companies for several years, and we would be happy to put our experience to work for you. Visit our website or give us a call at 573-552-8403 to learn more! We Put The Web To Work For You! Copyright 2016. MSW Interactive Designs LLC. All rights reserved.. Powered by Blogger. What is Google My Business and WHY is it Important For Your Business? Does My Website Need a Security Certificate? "Hey Siri, Find My Local Business"